Mr. Aitch and I needed some sustenance while on our spontaneous weekend get-away to Gettysburg two weekends ago. The complementary breakfast at the hotel was good. Coffee, tea, milk, apple and orange juice. Bread, bagels, muffins, Danish. Butter, jams, peanut butter, honey. Three kinds of cereal. One flavor of yogurt – strawberry banana. Fresh apples and oranges. “Scrambled” (aka powdered) or hard-boiled eggs. Sausage patties and links. And not one but two waffle makers with regular or blueberry waffle mix. My only complaint about the waffle makers was that some parents allowed their children to operate them. And in doing so tied them up for more time than necessary because the children could not follow the directions. Of course, some of the adults had a hard time following the directions, too. Fill. Close. Turn. The timer is activated when turned. The waffle is done when the timer goes off. Don’t keep opening it up. Sunday morning breakfast wasn’t as crowded as we thought it would be as most of the bikers were still in bed after the BIG doings the night before so Mr. Aitch and I could each have waffles without having to wait. Monday morning was a different story. 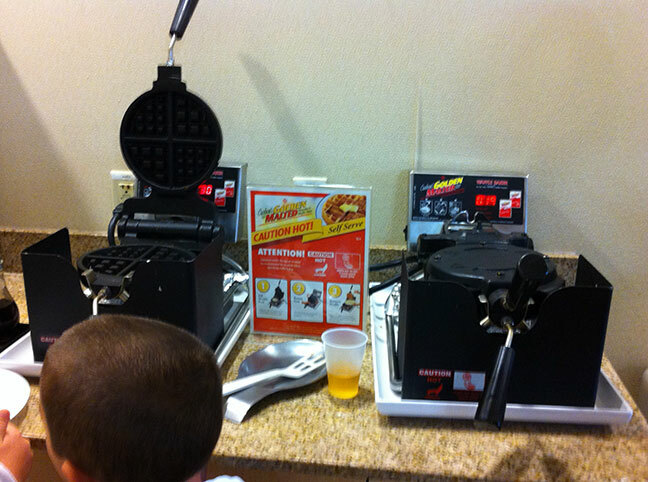 The kids were too short to fill, close, and turn the waffle makers. But they tried. And their parents allowed them to try. There is a reason why the sign says you must be 16 years of to operate it. I opted for “scrambles” eggs, sausage links, a Danish and some tea. Mr. Aitch wanted a waffle so since I had a clear view of the waffle makers, I alerted him when one was free. Waffles = happiness. For dinner Sunday evening we decided to go to the Appalachian Brewing Company. They carry their handcrafted beers and sodas. Beer it was. Our waiter was great and since we had not been to an ABC before, he asked what kinds of beer we usually drank and suggested an ABC beer that each of us would probably enjoy. Mr. Aitch had a Maibock and I had a Hefe Weizen. Both were very good. The “Epic” Trail Burgers were hard to pass up. Mr. Aitch had the Boo-Boo Burger with a side of sea salt fries. 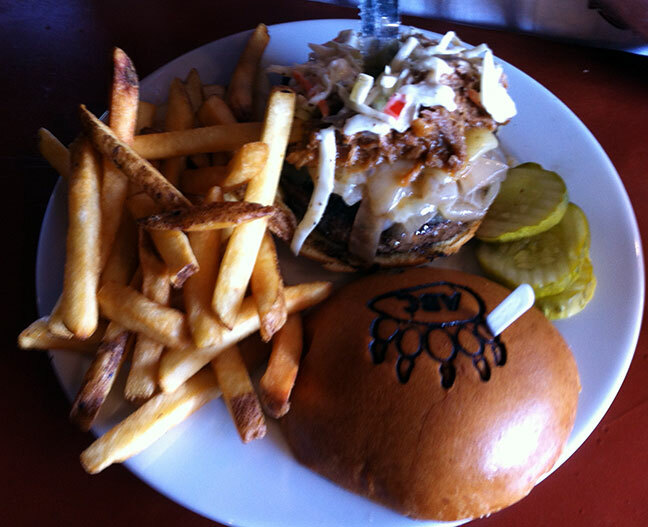 Boo-Boo Burger is topped with caramelized onions, white cheddar cheese, BBQ pulled pork and cole slaw on a toasted brioche bum. I had the Sasquatch with a side of ABC’s seasoned homemade Brewhaus chips. 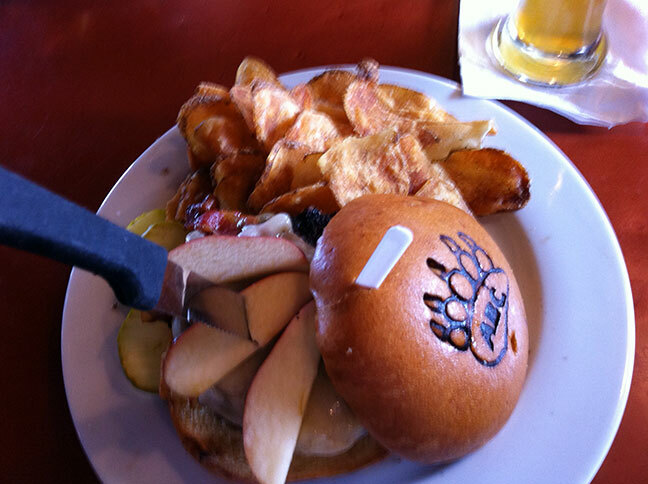 Sasquatch Burger topped with brown sugar caramelized applewood smoked bacon, caramelized onions, apple slices, and Provolone (my choice) cheese also served on a toasted brioche bun. 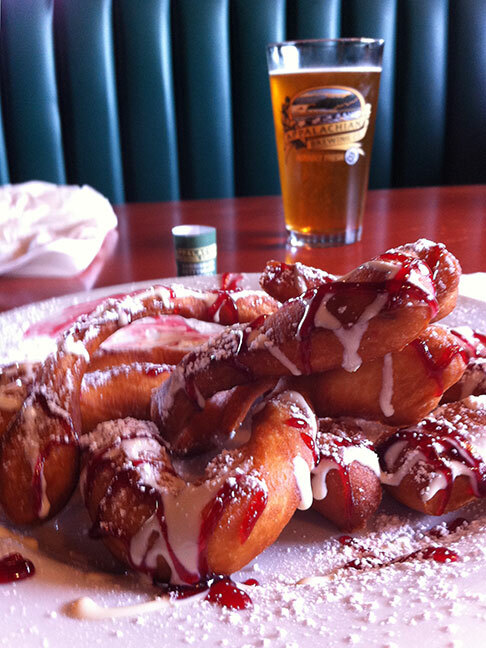 Zeppole for dessert: Deep-fried dough sprinkled with confectioner’s sugar and drizzled with raspberry vanilla sauce. Yum! Perfect ending for such a sobering day. This entry was posted in food, travel, vacation and tagged Appalachian Brewing Company, beer, food, travel, vacation, waffles by Patti_is_knittinginflashes. Bookmark the permalink. wow, looks like great food. I’m reading these backwards, from end of trip to beginning. I like your travelogues.